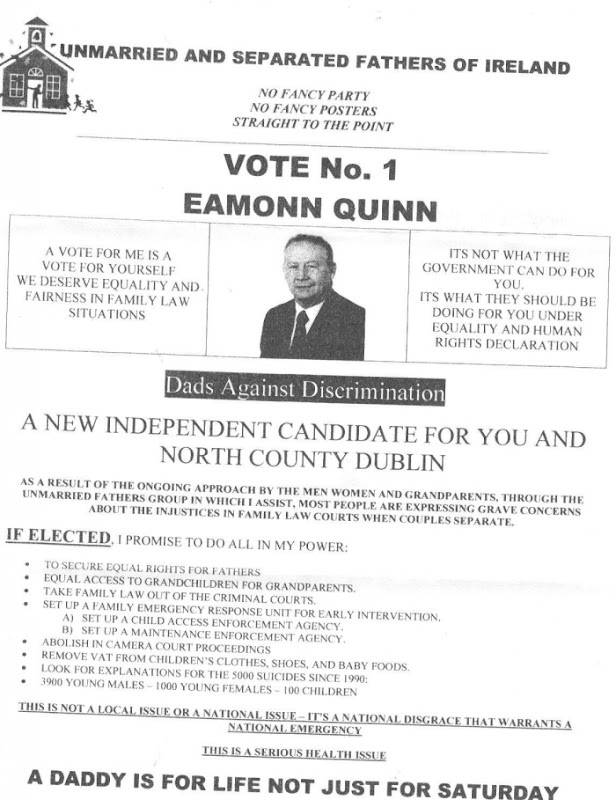 From the 2007 General Election Campaign a leaflet and broadcast from Fathers Rights – Responsibility Party (FRR) candidate Alan Beirne who was running in Dublin Central. 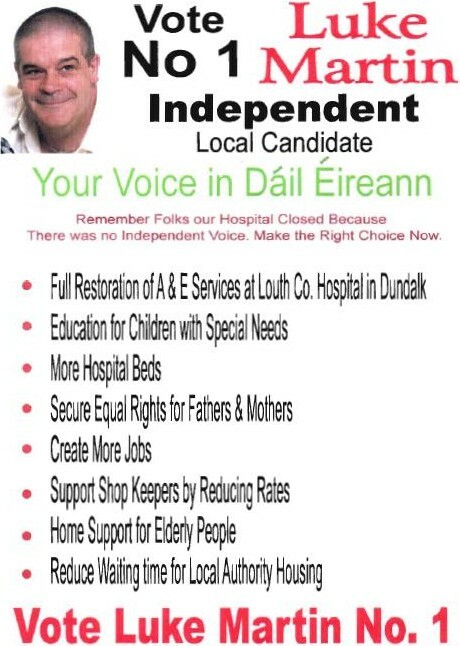 From the 2011 General Election Campaign, a flyer from Independent candidate Luke Martin running in Louth. Amongst the items he is campaigning for are the retention of A+E services in Dundalk Local Hospital, Secure Equal Rights for Fathers & Mothers as well as Create more jobs. This is from either Dublin South 2007 (or Meath 2005?). Liam O’Gogain continuing his election campaigns to promote fathers rights. 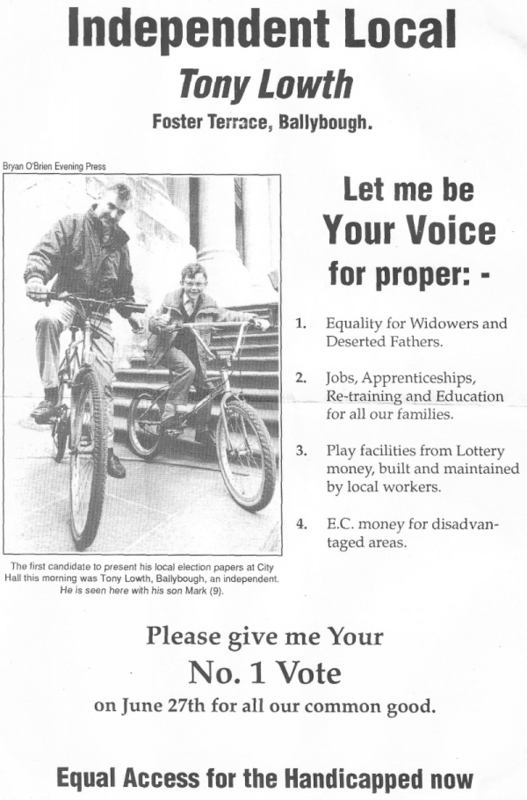 Tony Lowth from the 1991 Local elections in the North Inner City. Lowth a campaigner for deserted fathers (He took a number of legal cases regarding the fact that a deserted husband with dependents was not entitled to the same allowances as a deserted wife with dependents). Liam O Gogain is amongst a group of Fathers rights campaigners that have stood for a number of elections to raise the profile of the issue. This is his 2004 European Election -‘East’ – leaflet. This is from 2002 GE in Dublin North. There have been a number of candidates and groups going under various Fathers rights banners. The Fathers Rights-Responsibility Party being possibly the most prominent.